I bought this scope in June 2005. I intended it to be my "final" telescope, as I really can't justify buying anything larger. This hasn't stopped me buying smaller scopes though. The scope originally had the Celestron narrow dovetail rail, but when I upgraded my EQ-6 mount to the wider "Losmandy" standard I replaced the narrow dovetail with a Baader 3" dovetail rail. This made the scope feel a lot more secure on the mount, and is the set up shown in the picture. The first William Optics saddle clamp I fitted to the mount was almost too wide for the Baader rail, and a newer WO clamp I bought could not grip it at all. I traded the original narrow Celestron rail for a Celestron CGE rail (another C9¼ owner wanted a narrow rail but had bought a second hand scope with the wide one) but found that this is also too narrow for the newer WO saddle clamp. However, a simple modification of the saddle increased its clamping range sufficiently to cope with either rail. 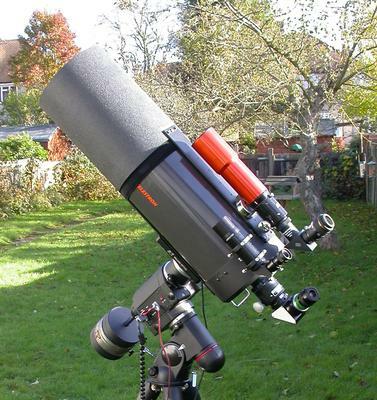 I decided to use the Celestron rail as it has some correction for "cone error" and is a nice orange colour! Other accessories shown in the picture include a ScopeStuff universal mounting plate (which is carrying a William Optics ZS66 SD scope) an Astrozap flexible dewshield (which I've cut away to fit around the dovetail and the top plate) and a Baader SCT Crayford focuser. The finder is an Antares 7x50 right angle correct image unit, in a William Optics bracket, but with a 66mm scope piggybacked it's a bit surplus to requirements. A simple red dot finder is more useful when aligning the goto mount anyway. With all these heavy accessories the EQ-6 mount needs more counterweights than the two supplied. The picture shows my home made 20lb cast lead weight sandwiched between the two standard weights.